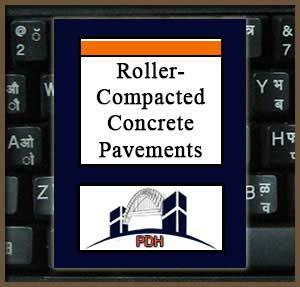 Procedures and criteria described here are applicable to the design and construction of roller-compacted concrete (RCC) pavement (RCCP). Roller-compacted concrete pavement employs a concrete paving technology that involves laydown and compaction of a zero-slump concrete mixture using equipment similar to that used in placement and compaction of asphaltic concrete pavement. By using these construction techniques, the potential exists to save one-third or more of the cost of conventional concrete pavement. Although the concept and technology behind RCCP is relatively new, RCCP has already proven itself cost-effective in projects including log-sorting yards, port facilities, heavy equipment parking areas, tank trails, and haul roads. Learn about cold joints, curing, and overall quality control. This course is intended for civil and highway engineers and other design and construction professionals wanting an introduction to the technologies, equipment and construction practices for roller-compacted portland cement concrete pavements. This course will give engineers and others an introduction to the materials, methods, delivery and placement of roller-compacted portland cement concrete pavements. This course will give you professional tools that will allow you to address roller-compacted concrete pavement issues in design and construction.